PaRappa the Rapper Remastered (game, 1996). A rhythm video game by Sony Computer Entertainment/Sony Interactive Entertainment Inc. Developed by Japan Studio, epics (PSP/PS4), Sony Interactive Entertainment Inc., NanaOn-Sha, Sony Interactive Entertainment. Official Trailer. 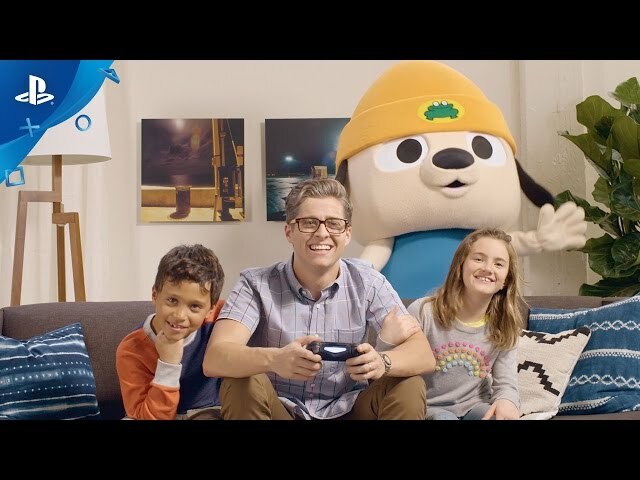 PaRappa the Rapper Remastered is a rhythm video game by Sony Interactive Entertainment Inc. and Sony Computer Entertainment, developed by NanaOn-Sha, Sony Interactive Entertainment, Sony Interactive Entertainment Inc. and Japan Studio, epics (PSP/PS4). 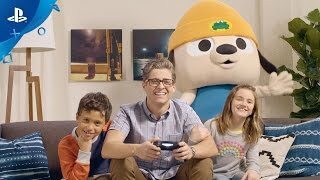 PaRappa The Rapper Remastered - PlayStation Experience 2016 Trailer | PS4. The player takes on the role of PaRappa, a paper-thin rapping dog, who is trying to win the heart of a flower-like girl named Sunny Funny. However, he is intimidated by the presence of Joe Chin, a rich, narcissistic dog who goes overboard with his attempts to impress Sunny. To impress Sunny Funny, PaRappa learns to fight at a kung-fu dojo, and takes a driver's education course to get his license. However, when he crashes his dad's car, he has to earn money at a flea market to pay for it. When Sunny's birthday comes up, PaRappa has to get cake, but ends up ruining it after an encounter with Joe. He makes a new one by watching a cooking show and proceeds to eat a lot of it on the day. When spending some time alone with Sunny, he is suddenly overcome with the need to go to the bathroom and has to rap against his former teachers to get to the front of the queue. Then one night, PaRappa is invited to Club Fun, and asks Sunny to go with him, to which she agrees. PaRappa then raps on stage with everybody, rapping solo at the end of the song and expressing his feelings for Sunny. PaRappa the Rapper is a rhythm game in which the main character, Parappa, must make his way through each of the game's six stages by rapping. As the teacher raps, a bar at the top of the screen will appear, showing symbols that match up to the teacher's lyrics. The player must then make Parappa rap in response to the teacher by pressing the buttons with the correct timing to match the teacher's line.During gameplay, a "U Rappin'" meter determines the player's performance, ranking it as either Awful, Bad, Good or Cool. By consistently staying on beat, players will stay in the Good ranking area. If the player performs a bad line, a lower ranking will flash, and if the player performs badly twice in a row, he will drop to Bad, followed by Awful. To regain a higher ranking, the player must play well twice in a row to move up a rank. To clear a stage, the player must have a Good ranking by the end of the song. If the player ends the song on a Bad or Awful ranking, or drops below Awful ranking at any point in the song, they will fail the song and have to start over. After the game has been cleared once, the player can attempt to achieve a Cool ranking. This is achieved by freestyling in a manner different from the predetermined lyric. If the player performs a successfully impressive freestyle when the Cool rank is flashing, they will enter Cool mode. In this mode, the teacher will leave the stage, allowing the player to rap freely and earn some large points. If the freestyling fails to impress twice in a row, the teacher will return and gameplay will resume in the Good ranking. Ending the stage with a Cool rank often results in a special level ending, and clearing all stages on Cool Mode unlocks a bonus mode with characters Katy Kat and Sunny Funny. PaRappa the Rapper Remastered was scheduled to be released by Sony Computer Entertainment and Sony Interactive Entertainment Inc. on December 6, 1996, on September 26, 1997, on November 17, 1997, on December 7, 2006, on July 6, 2007, on July 17, 2007, on August 9, 2007 and on April 4, 2017. This video game is available for the following platforms: PlayStation, PlayStation Portable, PlayStation 4.